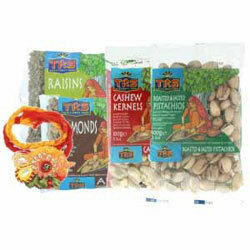 This gift set for your Brother at Raksha Bandhan (Rakhi) comprises Rakhi Band(s) and 300g of Dried Fruit and Nuts. When you check out you can select to send to your Brothers home or work address and specify a personal message for him which we will include with the gift. Select the number of Rakhi Bands and your choice of Dried Fruits/Nuts - The price will be calculated when you add to basket. Remember, you must still use your Card Billing Address for the payment so everything clears this end. "Dear Spices of India, First time I have used Spices of India - very impressed! Received goods very quickly. Without a doubt I will be using you again... Thank you."